LAP is an inflammatory process of the pancreas that can remain localized, involve regional and distant organs, or cause overwhelming illness or death. While the exact etiology and mechanisms of AP is still controversial, 70%- 80% of cases are caused by alcohol abuse and common bile duct obstruction with gallstones . It is thought that an initial insult to the pancreas causes the premature activation of digestive enzymes, mainly trypsin, found in the organ’s acinar cells. When inappropriately activated, trypsin causes pancreatic inflammation and auto-digestion, which can cause a release of amylase and lipase into the serum. In severe cases, this release of trypsin can mediate the release of other pro-inflammatory cytokines, such as tumor necrosis factor (TNFα) and proteolytic enzymes into the circulation, resulting in pancreatic necrosis, systemic inflammatory response syndrome (SIRS), septic shock and muti-organ failure . Serum amylase measurements can be useful in screening for acute pancreatitis because tests have a high sensitivity level, are readily available and inexpensive to obtain. However, the main drawback of amylase is in diagnosing AP is its low specificity. Amylase is found throughout the digestive tract and may be elevated from numerous medical conditions, certain drugs or surgical procedures, or can remain normal in alcohol-induced pancreatitis or in cases caused by hypertriglyceridemia . 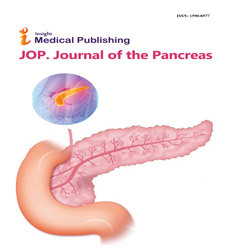 In contrast, lipase is synthesized and stored mainly within the pancreatic acinar cells, with lipase activity in the pancreas measuring four times greater than amylase activity . Lipase also stays elevated longer in the serum, and therefore is a better indicator of pancreatitis in patients with delayed presentation . These combined properties make lipase a better overall diagnostic marker. While pancreatic enzymes remain an important part of diagnosing AP, the Atlanta classification of acute pancreatitis was revised in 2012. The revised criteria states that only two of the following three features are needed to make a diagnosis of AP: Abdominal pain including acute onset of a persistent, severe, epigastric pain often radiating to the back; serum lipase or amylase activity at least three times greater than the upper limit of normal; or signs of pancreatic inflammation or edema on CT, MRI or transabdominal ultrasonography . These changes reflect a growing body of research showing that isolated increases of serum amylase or lipase can be caused by a variety of factors, and therefore, is not necessarily specific for diagnosing AP. Additionally, these current guidelines confirm that abdominal pain with positive imaging is sufficient to make the diagnosis of AP even in the absence of elevated amylase and lipase. A Thirty-two-year-old Hispanic male was admitted with severe, acute abdominal pain (10/10) and distention for several days with progressive worsening. He admitted a history of recurrent abdominal pain and a similar episode one year ago, for which he was hospitalized and was unaware of the diagnosis. His past medical history is significant for diabetes mellitus, end stage renal disease on hemodialysis, and acute pancreatitis. The patient reported a prior history of alcohol use, but stated that he had quit recently due to abdominal pain. He admitted to having shortness of breath, however, denied dizziness, headache, chest pain, numbness and tingling. Physical examination demonstrated a distended abdomen, decreased bowel sounds, and diffuse tenderness to palpation. He had a right paraumbilical ecchymosis of approximately seven cm in diameter. He was tachypneic with decreased breath sounds bilaterally. However, he was alert and oriented. 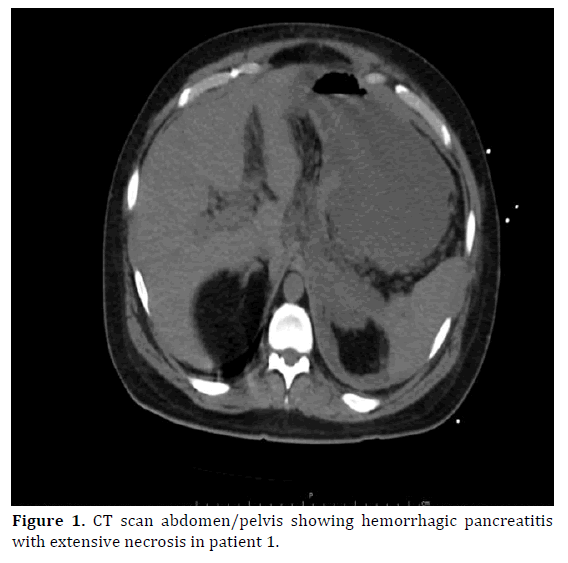 A CT scan of the abdomen without IV contrast showed retroperitoneal hemorrhage, with inflammatory changes in the upper abdomen surrounding and involving the pancreas, indicating necrotizing or hemorrhagic pancreatitis (Figure 1). The possibility of pseudocyst formation was also likely and could not be completely excluded. Bile duct diameter was within normal range. In the ER, patient was subsequently stabilized with IV fluids, started on broad spectrum antibiotics and transfused with two units of blood. His condition was deemed not suitable for immediate surgical intervention due to an increased risk of intraoperative demise. The following day, the patient’s amylase and lipase both showed an upward trend of 111 U/L and 40 U/L, respectively, but well within the normal range. The patient’s condition deteriorated on day two of admission. Physical exam revealed evidence of worsening retroperitoneal bleeding, with periumbilical and flank ecchymosis. Despite efforts of stabilization, the patient went into spontaneous cardiac arrest within a few hours of exacerbated bleeding. ACLS was performed, however, was unsuccessful in reviving the patient. Autopsy showed pancreatic necrosis. Figure 1. CT scan abdomen/pelvis showing hemorrhagic pancreatitis with extensive necrosis in patient 1. A Forty-five-year-old Caucasian male was brought to the ED after being found unconscious by his fiancé. She reported that following a verbal disagreement, the patient closed himself in a room and about thirty minutes later, was found unresponsive and surrounded by several empty narcotic medication bottles. The patient had a history of alcohol use. A prior abdominal CT scan showed signs of fatty liver, but no pancreatitis. Past medical history was also significant for hypertension, COPD, GERD, and depression. There was no documented history of any hereditary pancreatitis or cystic fibrosis. Upon arrival to the emergency department, the patient was unresponsive, tachypneic and hypotensive with a blood pressure of 73/47 mmHg. The remainder of the patient’s physical exam was unremarkable, showing a soft, non-distended abdomen. Labs indicated septic shock with associated organ damage. Notable values were: WBC: 28.8 × 109/L (range 4.5-11.0 × 109/L), Potassium: 5.9 mEq/L (range 3.5-5.1 mEq/L ), BUN: 45 mg/dL (range 8-20 mg/ dL), creatinine: 5.1 mg/dL (range 0.6-1.2 mg/dL), AST: 154 U/L (range 15-41U/L) , ALT: 48 U/L (range 17-63), ALP: 55 U/L (range 25-100 U/L). Amylase measured 46 U/L (range: 36-128 U/L), and lipase measured 31 U/L (range 22-51 U/L). GGT was not done. All the other labs including the lipid panel were normal. Arterial blood gas showed: pH 7.29/pCO2 31.6 mmHg/pO2 715 mmHg/ HCO3 16 mmol/L. EKG showed normal sinus rhythm, and chest x-ray revealed patchy infiltrates, atelectasis in the right mid to lower lung field. Urine drug screen returned positive for benzodiazepines, opiates, and cannabis. The patient was intubated, stabilized and admitted to the ICU. Over the next several days, the patient’s labs and vital signs begin to normalize, and he was extubated. He complained of shortness of breath, cough and chest pain, but had no complaints of abdominal pain. Imaging showed a left-sided pleural effusion and persistent leukocytosis. Despite bronchoscopy, IV antibiotics and oxygen therapy, the patient’s respiratory status continued to deteriorate. A CT angiogram of the chest done on the eight day of admission revealed a large pleural effusion, and a left sided sub-segmental pulmonary embolism. CT also revealed diffuse pancreatic thickening with a large amount of peripancreatic edema that extended into the retroperitoneum (Figure 2). The patient’s pancreatic enzymes remained within the normal range with an amylase of 107 U/L , and a lipase of 45 U/L. Treatment in the ICU continued with broad spectrum IV antibiotics, aggressive hydration, and anticoagulation. Figure 2. 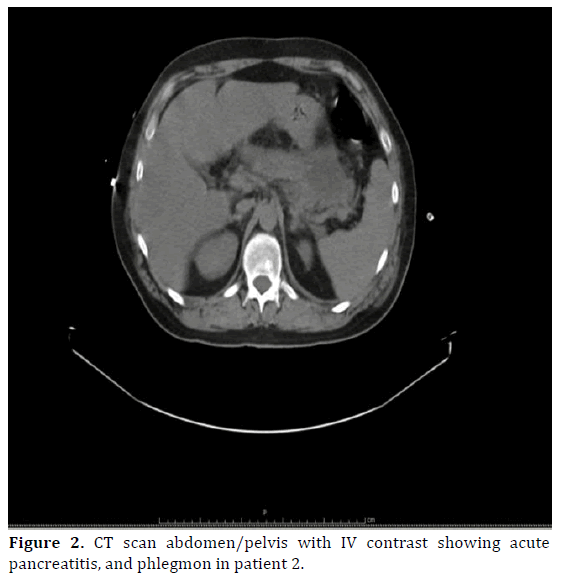 CT scan abdomen/pelvis with IV contrast showing acute pancreatitis, and phlegmon in patient 2. A repeat chest x-ray showed a left sided pleural effusion and signs of a developing empyema. A CBC revealed persistent leukocytosis and new onset bandemia of 28% (range 0-10%). The patient had no complaints of abdominal pain. 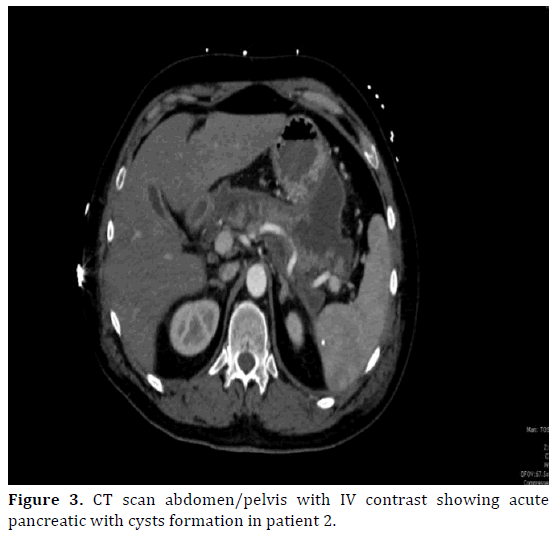 A repeat CT of the chest, abdomen and pelvis done on the fifteenth day of admission showed cystic changes of the pancreas with progressive edema and fluid collections (Figure 3). The patient now complained of severe abdominal pain. Again, the patient’s serum amylase and lipase remained normal at 111 U/L and 40 U/L, respectively. Due to the patient’s respiratory distress and continued deterioration, he was evaluated by a thoracic surgeon and transferred to a nearby facility for surgical intervention. Per contact with the family, patient has been doing well currently. There was no subsequent CT scan done on the patient in the outpatient setting. No endoscopic ultrasound was ever done. Figure 3. CT scan abdomen/pelvis with IV contrast showing acute pancreatic with cysts formation in patient 2. Acute pancreatitis has been studied extensively since time immemorial. While clinical symptoms and confirmatory imaging (Abdominal imaging with CT, magnetic resonance, transabdominal ultra-sonogram, or endoscopic ultrasound) can make a diagnosis of acute pancreatitis, the most common presentation of AP is abdominal pain with elevated serum amylase and lipase usually three times the upper limit of normal. Cases of confirmed AP in the setting of normal amylase are less common, while cases with normal levels of lipase exceedingly rare. During an attack of acute pancreatitis, lipase levels increase rapidly within five to seven hours of onset, peak at 24 hours and remain elevated for one to two weeks [5-6]. It is a well-represented fact that lipase levels are more sensitive and specific than amylase for diagnosis of acute pancreatitis, with a negative predicted value of 94%-100% [5-6]. Our research found only three published reports of acute pancreatitis without corresponding increases in serum lipase [5-8]. Common to both patients presented here was a history of heavy alcohol use, and was likely the inciting event to their eventual development of AP. Both patients also met the criteria for severe acute pancreatitis. The current practice in the medical field is to rule out pancreatitis if the serum lipase levels are normal, but the current case series shows that patients can have severe pancreatitis in absence of elevated amylase and/or lipase levels. Due to lack of well-designed clinical studies, it is not fully understood why patients in this setting would present with normal serum levels of both amylase and lipase throughout their hospital course. These cases confirm that while uncommon, acute pancreatitis with normal serum amylase and lipase is a phenomenon which can occur. This suggests that further research is needed to better understand the mechanisms underlying the development of AP and the role that these digestive enzymes play. Hence the suspicion of pancreatitis should be high in patients with classic signs and symptoms. The laboratory tests should be accompanied with abdominal CT scan with IV contrast (if there is no contraindication) so no diagnosis of pancreatitis is missed. Fan H, Chen A, Zhang X, et al. Severe acute pancreatitis with normal lipase serum level complicating leukemoid reaction. J Chin Clin Med 2009; 473-5. Ko K, Tello LC, Salt J. Acute Pancreatitis with Normal Amylase and Lipase.Best of Gastroenterology.